Capture the heart of Catalunya on this day tour to the iconic Montserrat and it's Royal Basilica and enjoy some sparkle in the rural cava cellars of world famous cava producer, Codorniu. The day starts with a morning visit to Montserrat where you’ll explore the monastic centre of Catalonia, home to the famous black virgin & la Escolania (children’s boy choir). You’ll also have time to explore the magnificent natural park & mountains with spectacular views over the plains of Catalonia. After lunch, you’ll be transported through the back roads to the wine country, where you’ll visit the renowned local winery, Codorniu for a tour in their vast underground cellars followed by a tasting of the famous Cava 'champagne'. 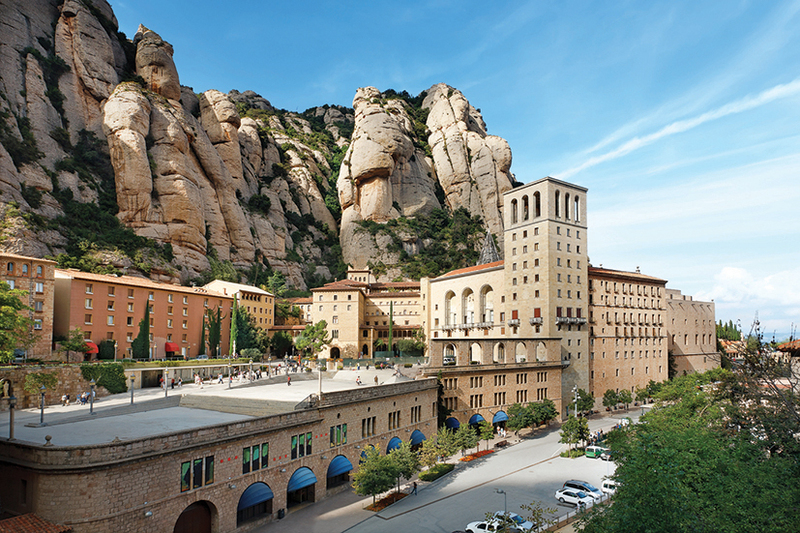 A day tour from Barcelona to Montserrat is a must for the majority of visitors to Barcelona. It's probably the one place that they have heard all about before they arrive. The advantage of taking one of our small group day tours from Barcelona is that we can avoid the crowds and stay well clear of the other larger tour operators. Our day starts at 8.30am from our office opposite the Palau de la Musica building. From here, the journey to Montserrat takes us about an hour or so. One of the main reasons people book with us is that they want the intimacy of a small group, but like to have somebody there to explain things. Keeping to our philosophy of giving you plenty of free time to explore on your own, but guiding you in the right direction, the first thing we do on arrival is explain the various options. A visit to the sanctuary where the ‘Moreneta’ is housed is a must. The sanctuary has been in use for almost 1000 years for those pilgrims and other visitors who have climbed this spectacular mountain. You’ll also have the opportunity to visit the fascinating Museum of Montserrat, with its five collections, ranging from Archaeology from the Biblical East to Modern Painting and Sculpture. A highlight of visiting Montserrat is listening to one of Europe’s oldest children’s choirs, La Escolania de Montserrat. They usually sing at 1pm on weekdays and noon at the weekend. Besides these cultural possibilities, there are numerous walks around Montserrat, ranging from easy strolls to serious hikes. Each trail offers a different perspective on the stunning views over the surrounding landscape, many of which are peppered with small chapels and hermitages. You'll easily find a route to suit your taste and energy levels. But whether they're fairly strenuous treks or gentle walks, they all give you fantastic views to marvel at the unspoiled beauty of this protected natural park. If you'd rather not walk at all, then another option is to take one of the two rack railways, or the cable car, offering yet more views of the area. After a morning in Montserrat, we leave the mountain at around 2:30pm, heading for Sant Sadurní d’Anoia, home to the famous Cava champagne and, in particularly, home to Codorniu where we'll visit their vast underground wine cellars. Sant Sadurní d’Anoia is situated in the Penedès wine-growing region, which boasts one of the widest varieties of grape of any wine-growing region in the world. The tour at Codorniu is a great chance to see exactly how the famous sparkling wine is produced, from the first pressing of the grapes to the second fermentation in the vast expanse of cellars. Of course, no winery visit would be complete without a taste of the stuff! At the den of the tour you'll get the chance to try some of the best Cava the region produces. We leave the winery at around 5:30pm, returning to Barcelona for around 6:30pm.